EHT Fiber Optic Isolators provide robust, noise-immune, high voltage isolation to TTL control signals with easy-to-use plastic fiber that requires no terminations or polishing. They can be used as the driving signal for EHT power systems, trigger oscilloscopes or other laboratory equipment, or isolate control rooms from pulsed power systems. The fast rise and fall times and low jitter are ideal for applications that require precision timing. 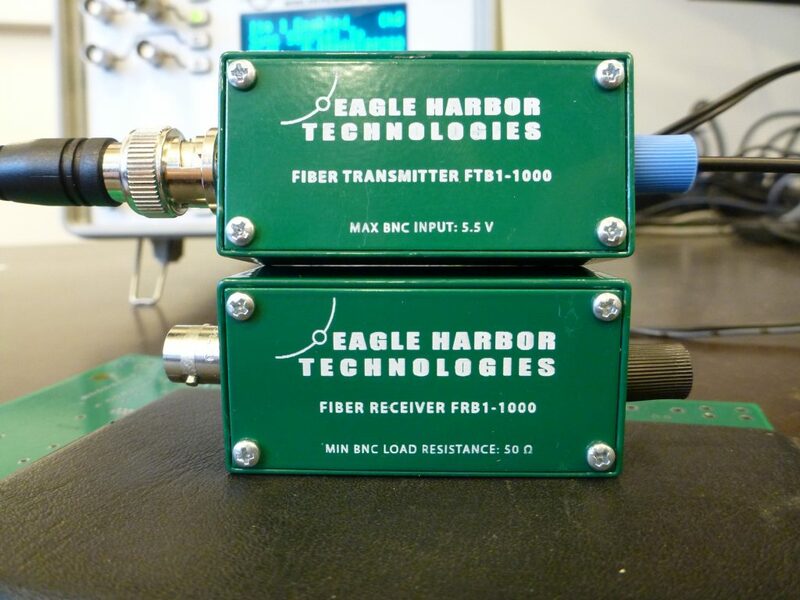 The FT-1 is a compact single channel BNC to fiber optic transmitter. The FT-16 is a 1U rack mount 16 channel fiber optic transmitter. Channels may be operated individually or synchronously. The FT-16 can also be fully controlled using the 68 pin back panel SCSI connector that integrates seamlessly with multiple National Instruments timing and control cards. The FR-1 is a compact single channel fiber optic to BNC receiver. The FR-8 is a 1U rack mount 8 channel fiber optic receiver. Channels may be operated individually, or synchronously. It has both high speed 50 Ω TTL outputs and high current Form C relay outputs. Each relay’s common, normally closed, and normally open pins are accessible on the back panel with screw terminal connections. When a channel is activated, its corresponding relay goes to the normally open position, which allows the FR-8 to be used for a wide range of applications including power supply interlock control, charge/dump control, and general switching and control. 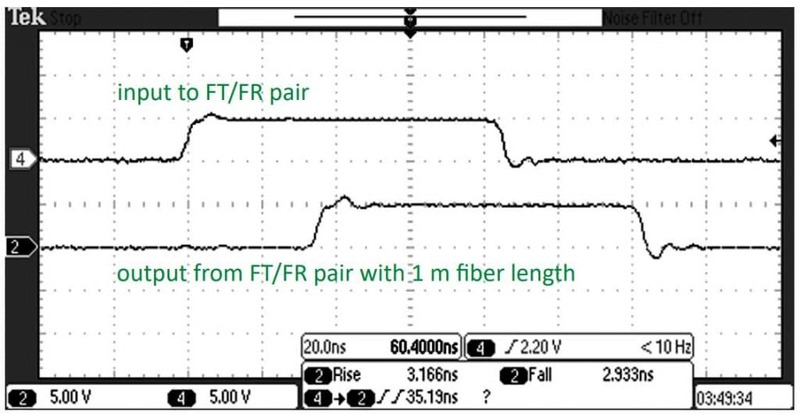 Plot of FT/FR pair rise, fall, and delay into 50 Ω.